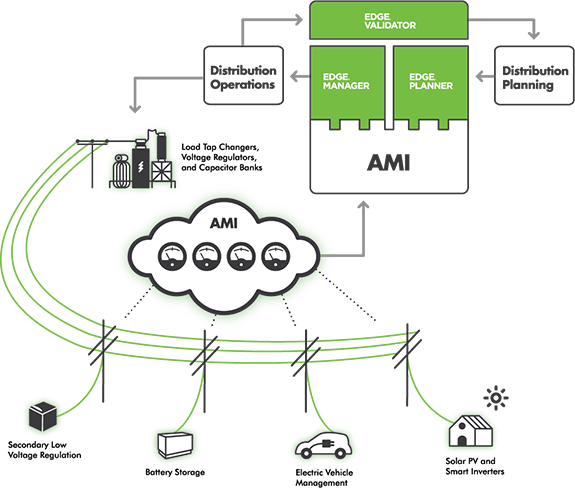 EDGE has uniquely solved the voltage optimization challenge by measuring customer voltages using AMI and other sensor networks to make real-time control decisions. EDGE does not require a detailed distribution model to operate and as a result is extremely cost effective to implement and maintain once the system is up and running. The AMI based voltage optimization methodology of EDGE is patented and has proven to be one of the safest, most reliable solutions on the market yielding the greatest results. Optimizing the distribution system voltage without direct visibility of voltage to each and every utility customer can lead to out of band voltage conditions and less than optimum efficiencies. EDGE integrates into existing voltage control equipment, and SCADA/DMS systems using standard protocols. EDGE makes your SCADA/DMS more intelligent by leveraging customer voltages along with existing voltage control, reducing risks and lowering costs.